I was in awe of these beautiful beings. Here we were, two different species coexisting peacefully and harmoniously in the same time and space. I knew they were aware of my presence, and I was most certainly aware of them. It seemed very natural to be here together in this way. It was very sweet. As I was swimming the dolphin kick at the surface, a group of three dolphins rose beside me and broke the surface to breathe. We swam side by side, making close eye contact for the first time. I was spellbound by their presence at my side. I couldn’t take my eyes off those dolphin eyes, peering deeply into me. Their pace was a bit faster than mine, and I soon fell behind, but those few moments we were together were amazing! It was as if I was one of them. I want to do that again! I watched expectantly for another opportunity to swim by their side. Soon a group below me began to surface. I kicked hard, in an effort to be where they would be when they surfaced to breathe. When I realized I wouldn’t reach them, I stopped and floated, waiting for the next group to arrive. When I stopped, my head moved, as if on its own. Looking below and behind me, I saw one lone dolphin floating there. We made eye contact, and suddenly he swam right for me, at full speed. I thought he was going to hit me! In a split second, my eyes closed, my body shifted from its horizontal floating position to vertical, with my head fully submerged. When my eyes opened, I saw this dolphin hovering vertically just inches in front of me, looking at me! I was face-to-face, body-to-body with a wild dolphin! I laughed out loud through my snorkel and face mask. This dolphin was in my face, and all I could do was laugh! This was so unexpected! I could reach out and touch him! My intuition told me to keep my arms at my sides. That was hard! Laughing and snorkeling don’t go together. Water flooded my mask. I had to surface to clear it. I didn’t want to … I wanted to stay here longer and commune with my new friend. As I surfaced, the dolphin made some clicking sounds and swam away. I was alone in the water with these wild dolphins for about two hours. It seemed timeless. I kept remembering that dolphin face looking right at me. The dolphins are inviting me into their world. It feels natural to be here with them. There is nothing extraordinary about it. 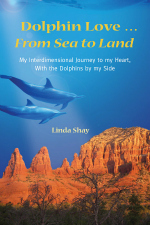 This is just one more exploration into the natural world; only this time I am exploring the world of dolphins, in their home, the ocean. I had no idea of the magic and mystery that was about to unfold in my life. I am still discovering the magnitude of the gift my dolphin friend gave me that day.